As near as I can tell this is a Eriophora transmarina from Australia. It was sitting in a covered glass on the counter top when I came home from work last night. A note on the top read. “Jessica saved your life. Beward! Spider! Real One!” I picked up the glass and shook it to get a better look at what was inside. It stayed still and curled up. 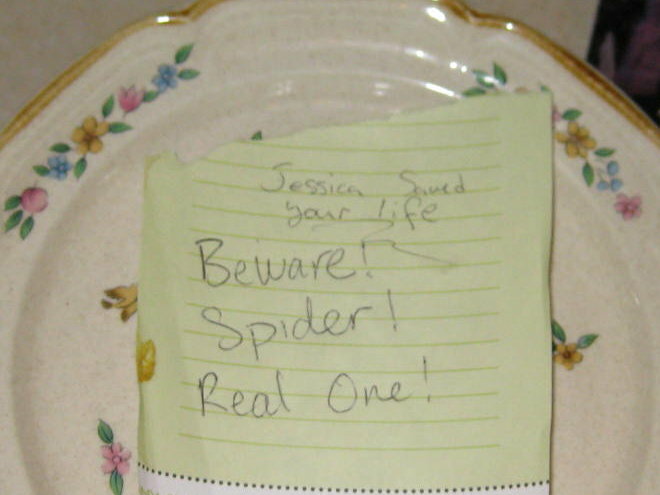 I thought that saving my life meant the spider got dead. I looked at its markings. 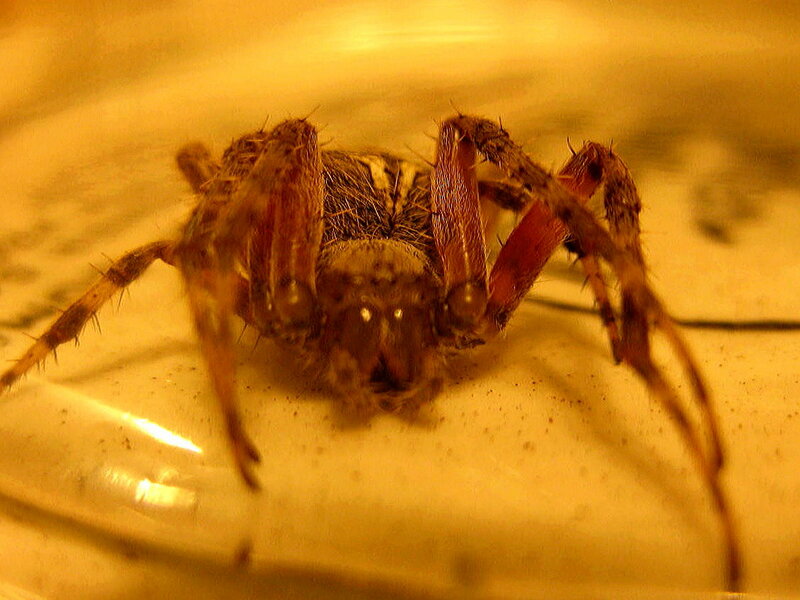 I was not keen on having poisonous spiders laying about and this one did come with a warning. Just a couple of days earlier I had noticed all kinds of spider webs popping up in the garden with beautiful big webs. I looked up orb spider because I remember Samson talking about orb spiders in the garden one day. Well, sure enough it was an orb weaver. And it is holding true that spiders that make pretty webs are pretty harmless. This orb weaver is harmless but will bite if provoked. This is just saying she is not looking for a fight but will defend herself if she has to. The bite is not terrible but you might want to avoid provoking her. I stopped shaking the glass now so as not to piss her off. 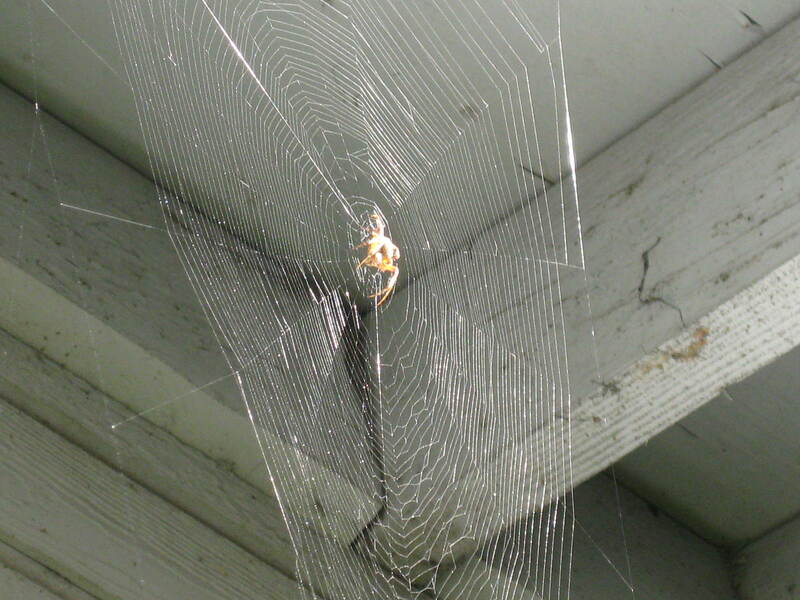 Here is a great site with some very interesting facts about this spider that looks like Charlotte from Charlotte’s web. She has the cute little bangs in the front and eyes all a glow. Amazing web making ability. How about alternating sticky line with non-sticky line. Silk web strong enough to net some birds. http://en.wikipedia.org/wiki/Orb-weaver_spider. Once I got a little movement out of her I turned her loose in the honeysuckle vine right outside the front door. She didn’t go very far either. Next morning there she was right above the front door, tucked under the eaves. Not that the web isn’t interesting enough but I will be reading between the lines and looking for a message from my dear Charlotte. Is that a ‘p’ I see just on the left there?